The popular all-in-one, now developed consistently with Bluetooth, color display and many other new features! CD, DAB +, Internet radio, FM, amplifier, media player and Bluetooth player, and all images on a high-resolution color display! Reinforcement of what moves us! The CVR-10 is equipped with a 2 x 30 watts 4 ohm Class-AB amplifier. This has an asymmetric volume control, which can be controlled both by the multi-function knob and via the remote control. The remote control can also be used to make bass and treble adjustments and to simulate environments such as stereo, live, stage and reverb via the built-in digital signal processor. If you like a little more dynamics, you can also connect a separate subwoofer or active speakers via the CVR-10's Pre Out output. In addition to classic FM reception, the CVR-10 also receives the new digital radio DAB +, which is now very common in Germany and sends in excellent CD quality. However, by far the largest station selection with over 25,000 stations from around the world receives the Internet tuner of the CVR-10, which you can operate either with WLAN or LAN cable. To keep track of this channel selection, you can register your CVR-10 over the Internet and easily manage your favorites. In addition, there are up to 10 fixed station memories per reception mode, which can be conveniently called up via the remote control. The integrated CD player is equipped with a solid CD drive that reads the media CD, MP3-CD, CD-RW and HD-CD. It's even easier to pair your smartphone, tablet or computer with the new built-in Bluetooth® feature. Just choose the CVR-10 as the output device and your music already plays, quite simply, without any complicated configuration. The CVR-10 works exclusively as a Bluetooth receiver, but not as a Bluetooth transmitter. Thanks to its network capability over Wi-Fi or LAN and the DLNA standard, the CVR-10 can connect to virtually any PC, music server or UPnP device (eg NAS) in the home network and use it as a music source. You also have the ability to play music wirelessly from various mobile devices through the CVR-10. With the free app "UNDOK ™" (available for iOS and Android) you can B. Use your smartphone as a CVR-10 remote control and select functions such as station selection and digital sources. In addition, they can control the volume and the standby mode on the new CVR-10 via APP. The USB port integrated into the front can even play music from USB sticks or hard disks. The CVR-10 processes the standard formats AAC, AAC +, MP3, WAV, WMA, FLAC and even gapless! 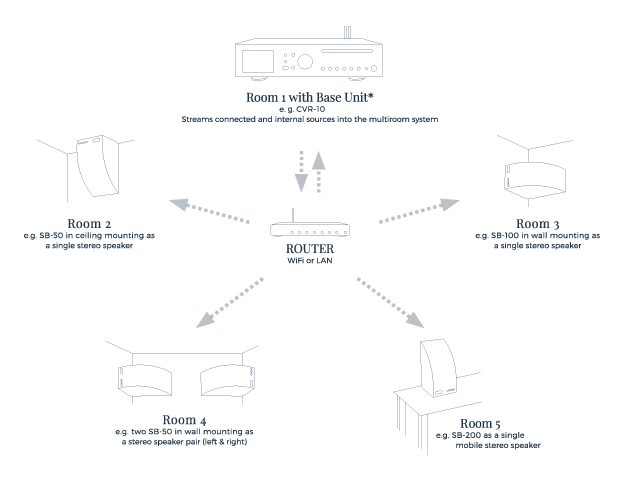 * To set up a multiroom audio system, a basic unit is not required. Multiple network speakers (SB-50, SB-100, or SB-200) can also be combined into a multi-room system alone. A maximum of 5 individual network devices (network loudspeakers or basic devices) can be combined to form a multiroom system. The CVR-10 has native Spotify® support. The prerequisite is that you have a Spotify® Premium account. Simply select the CVR-10 as the output device in your Spotify® app and stream the music over your Wi-Fi network. You do not have a premium account? No problem, just play Spotify free via the integrated Bluetooth function. The control center for all signals. In addition to 2 analog RCA inputs for z. For example, a cassette player, TV, or satellite receiver, the CVR-10 also offers inputs for digital sources: one optical and one coaxial input. Integrated into the front is a 3.5 mm headphone jack and a line-in input, via which a mobile device can be connected. Remote Control? Learn something again! Learnable remote controls are like sand on the sea. But we go one step further and offer you an absolute novelty in the CVR-10. You can easily teach the CVR-10 to listen to the remote control of your TV or any other device. A useful feature to keep the living room table clear and tidy! Fall asleep with you and wake up with you. Easily choose with your remote control a time when the CVR-10 automatically switches to standby mode, leaving you to sleep. The CVR-10 supports two alarm times, eg. For example, an alarm clock for weekdays and the second for the weekend. You can switch these alarms on and off, set the time, choose between daily, individual days, weekends etc., the signal source with which you want to wake up and adjust the volume.